Apple Blossoms Ladybug sets a playfully festive mood for any occasion: Birthday, Congratulations, Thank You, Mother’s Day, Miss You or Just Because. Born out of Masha’s love for nature, this unconventionally beautiful greeting card brings a refined sense of botanic whimsy to your correspondence and expresses the majesty of spring any time of the year. 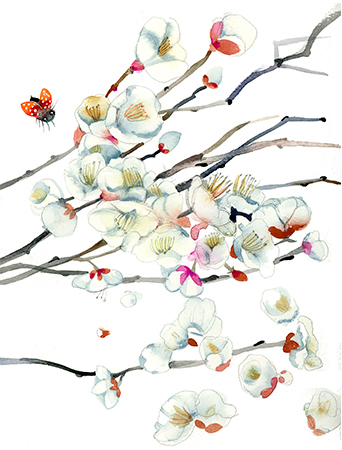 Apple Blossoms Ladybug watercolor greeting card by Masha D’yans is offset printed in USA with environmentally-friendly soy inks on luxuriously heavy, bright white matte stock, card measures 4.5×6 inches folded. The interior of this card is blank. The card and envelope are protected with a clear cello sleeve.